Last year Wildlife Safari added another member to our group of giraffes (called a tower). Erin has joined our other two giraffes, Miya (4 years old) and Mate (17 years old), and is getting along great! A very curious and adventurous young female, Erin (2 years old) is often the first to greet keepers. Erin and Miya, our females, are both Reticulated giraffes, and Mate, our resident male, is a Rothschild giraffe – much darker in color. Erica Sherrow, Giraffe Keeper and one of their primary trainers, says they all have their distinct personalities and are loveable in their own ways. Giraffes are sometimes called the ‘watchtowers of the Serengeti’, since their height lets them be the first to spot danger and alert any other animals nearby. If they start running, so do any other animals nearby, even if they can’t yet see the danger – no one wants to wait to find out if there really is a lion nearby or not! Giraffes have no vocalization that is audible to humans, they use body language to communicate. Keepers enjoy their expressions when working with them. “They give a lot of sass,” says Sherrow. During the winter, the giraffes spend more time inside their heated barn. Giraffes are built to live in hot environments, so if it gets below 50 degrees they stay close to their barn. Our giraffe keepers do training sessions just like with many of our other animals. The giraffes are trained to do some behaviors that make it a little easier to look after them. 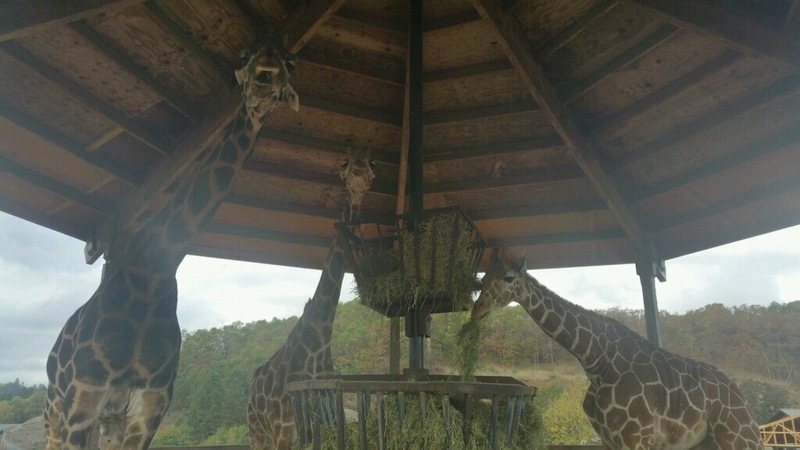 For example, presenting their feet for checks, or going into their barn and over to the scaffolding that allows keepers to stand at eye level with their tall, spotted friends. This training is mostly to get them used to being handled so that veterinary procedures, checkups and hoof trims can be conducted easily and without stress to the animals. Mate is entirely comfortable being worked on and touched, while Miya is a little more wary, and Erin has been making leaps and bounds with her training. “Erin has been moving through our training program like lightening,” says Sherrow. “We’ve already had her in the chute and been able to touch her.” Keepers use a chute that giraffes stand in, with panels that open to allow keepers to reach through and handle where ever needs attention, keeping a barrier between keepers and those long, strong legs. Numbers in the wild are dwindling. There are about 80,000 giraffes altogether left in the wild, with less than 1,100 Rothschild and 4,700 Retuculated giraffes. “Mostly through habitat fragmentation and poaching,” says Sherrow. “They’re poached for their hide and tails.” Both poaching and habitat fragmentation are serious threats. If their habitat is lost, they end up having nowhere else to go, since the closest habitat for them may be too far away. They have extremely long tongues (1 inch for every foot they are tall) designed to reach up into branches and grab leaves. These tongues are tough, so they can eat much tougher, spinier foliage than other grazers, including the leaves of the Acacia tree, a spiky plant that is one of their favorites. For a little while, our Tower had an honorary member, and a stripey one at that! Ruckus, our new Damara zebra took his time finding his way into our zebra herd, choosing instead at first to find some taller friends. He followed the giraffes around for about a week before deciding to join his fellow zebras.